Mini Metro is nothing like public transport. Riding the underground can be generously described as uncomfortably loud, hot and stressful, but to mention cramped. Mini Metro, on the other hand, is exactly the opposite with its lovingly quiet audio, minimalist art, slow-paced feel and spacious design. The London Underground map, with its simple lines dancing around a blank page, has always been impressive. To condense something so overlapping and sprawling into something so simple and easily understood is no easy feat, and it’s this basis that makes up the core mechanically and visual design of Mini Metro. Because this is not a hard game to understand. Stations pop into existence on screen, depicted as shapes, which you contact with your metro lines. Passengers appear as smaller shapes, indicating their final destination. A circle passenger will get off at any circle station, not a specific one. You’re not forced into memorising dozens of unique stations and their position on your increasingly crowded map. Your lines can also be altered as often as you’d like. With no money or resources needed, you can reshape your entire network by simply pulling lines to new stations or detaching them from others. The challenge is trying and make sure that all routes and connections have all the shapes possible, and Mini Metro doesn’t make that any more complex. Its simple, elegant and playful. The randomness of the game can make some runs much harder than others, but this game isn’t ultimately about the challenge. Stations appearing across the map can tamper things if an entire district is filled with the same shape, but Mini Metro is, in the end, a beautiful distraction that never feels overwhelming, even as the map becomes more complex. As time progresses on each map you’ll be given more resources, from extra carriages to new lines and even special trains and stations, but you’ll also have to accommodate more passengers. If a station becomes overcrowded for too long, you’ll lose. But it’s not a panic when you see the black circle start to envelope a station. Games typically last less than half an hour, and with dozens of maps to try, from London to Cairo, it’s just an excuse to move on. Different maps have different distinct but varied feels to them Toyoko’s trains run quicker while New York will have you spreading across the iconic islands. Playing on the Switch you can use either the Joycons or the touchscreen. Personally, the touchscreen for me was much more intuitive and easy to use, which the Joycons mouse made things a little too clunky on my beautifully smooth map. That being said, the controls can be annoying no matter what. More than once I accidentally I connected the wrong station to a route, and struggled to undo my mistake. Other times, I accidentally pulled a station from a route. Once you’ve got several lines running and overlapping each other it can be difficult to precisely organise it, but in the end, it’s either unimportant or possible with a little fiddling. It is a credit to the team how simple the game looks and feels while containing a surprising amount of information to learn. There’s also a lot of ways you can play as well. Inspired by the London Underground I preferred creating great looping lines that branched off to the less central stations, but later on, I started creating vast webs with express lines cutting between them. When most stations can be unlocked with a couple hundred points, earned by delivering passengers to their destination, you can experiment without ever feeling like you losing progression. I spent longer on Mini Metro than I thought I would. I thought the inherent simplicity of design and challenge would wear thin, but it just hasn’t. Watching your network of colourful lines intersect and separate, with little trains carrying little shapes around is wonderfully satisfying and deeply relaxing. Even though other games delve into the raw complexity of infrastructure and public transport, none have ever felt as clean and rewarding as Mini Metro. Fans of the nitty-gritty might not appreciate the simplicity on display, but Mini Metro is clearly not trying to create a true to life, difficult portrayal of the underground. 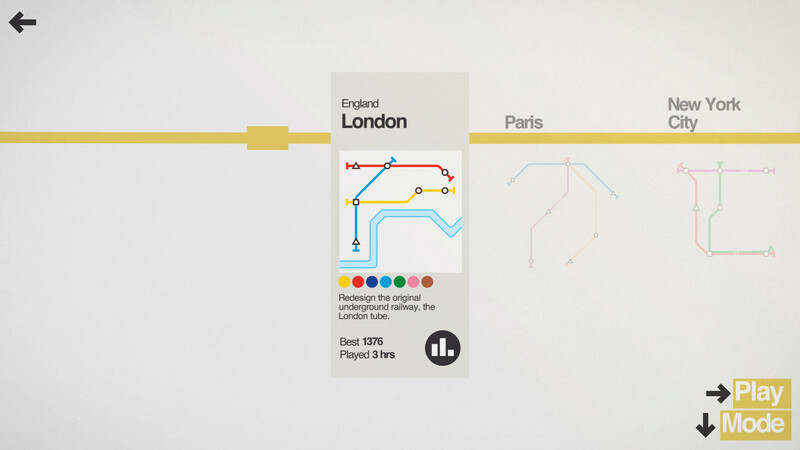 Much like the Underground map that inspired Mini Metro’s design, the game is a simplification of something long and complex. Reviewed on Nintendo Switch (code provided by the publisher). You can purchase the game on the Nintendo eShop. Mini Metro is nothing like real public transport. Millions of people don't have to use it each day, but they might just want to instead.